ButeFest 2018. Picture by Iain Cochrane. An early finish to the Saturday night, caused by the wind, failed to stop thousands of music fans enjoying Butefest last weekend at its new home. Two bands, Rura and Skippinish, were not able to play their sets due to strong winds. Among the acts who did take to the stage over the three days were The Hoosiers, Dougie Maclean and Tequila Mockingbyrd. 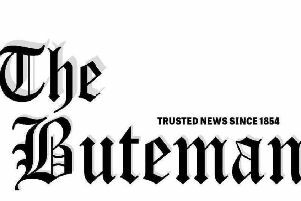 Butefest chairwoman Hazel Mullholand said: “The wind and the rain came out of nowhere really quickly. Obviously our primary concern was for the safety of everybody on site so we took the decision to close down as quickly and as safely as possible. “We were up and running again on Sunday morning. As for the festival’s new home at Ettrick Bay, Hazel added: “It’s worked quite well. There are obviously teething problems wherever you go but we will take that on board. Hoosiers at ButeFest 2018. Photo by Iain Cochrane. Trombonist Spencer from the Neville Staples Band at ButeFest 2018. Photo by Iain Cochrane. Guitarist Jacinta Jaye from the band Tequila Mockingbyrd at ButeFest 2018. Photo by Iain Cochrane. ButeFest 2018. Photo by Iain Cochrane. Dougie Maclean at Butefest 2018. Photo by Iain Cochrane. The Hoosiers at ButeFest 2018. Photo by Iain Cochrane.